What goes through the mind of a creature so cosmically powerful that entire worlds are viewed as dust motes, their inhabitants mere specks in the vast expanse of the universe? And what happens when that being decides it’s time to clean house? Sargeras was once the Champion of the Pantheon, sworn to protect and defend the worlds the Titans put to order. Now, he leads one of the greatest threats Azeroth has ever seen — an army to end all armies, unending in its malevolence. But what brought him to this fate? 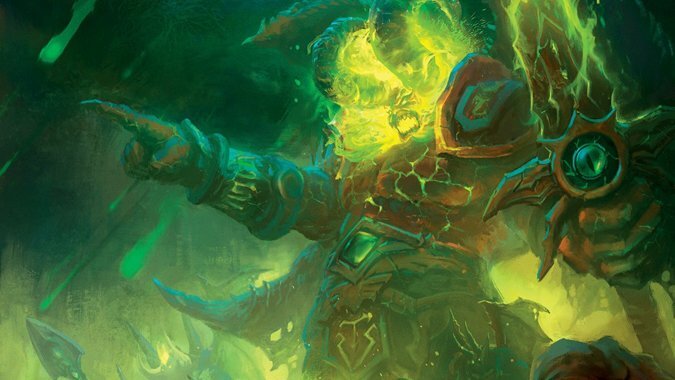 He may be the greatest villain in the Warcraft franchise, but Sargeras is far from infallible. He wouldn’t be in his current position if that were the case. 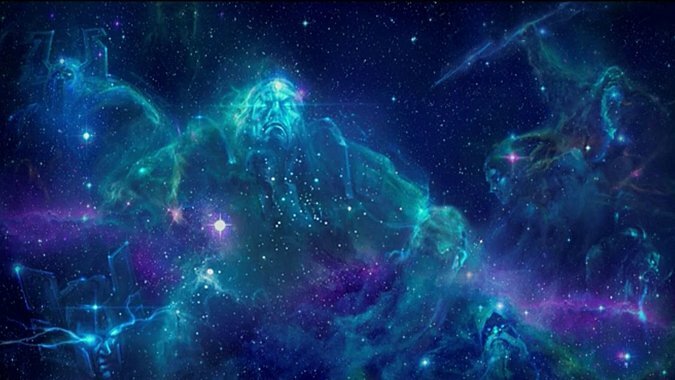 Long, long ago, Sargeras was born as any other Titan, from a fragile world-soul contained in one of the many worlds scattered across the Great Dark Beyond. And he was a mighty warrior — the best of anyone in the Pantheon, charged not with the ordering of worlds, but with defending them. It was on this task that Sargeras first encountered demons — creatures of chaos, born from the Twisting Nether. Easy enough work, for a Titan so powerful…but over the course of time, he began to notice these demons wielding energy that wasn’t chaotic and fel, but instead the darker magic of the Void. On top of that, the demons simply wouldn’t die. Once destroyed, they’d return to the Twisting Nether, where their bodies were reborn. After relaying this information to the Pantheon, they sent Aggramar to assist Sargeras in his battles. But although Aggramar was an apt fighter, it made little difference — the demons still returned. 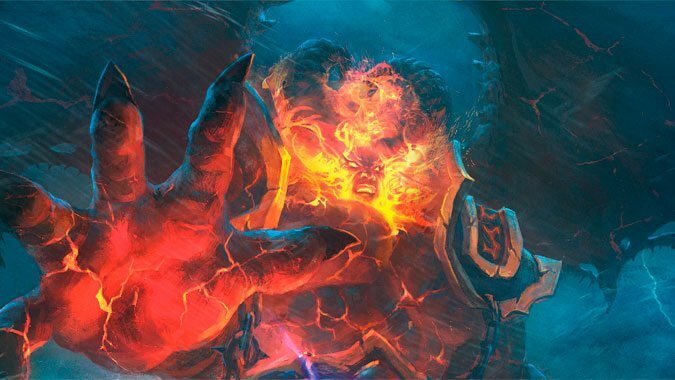 However, having Aggramar around meant Sargeras could devote more time to studying the Twisting Nether and figuring out some kind of solution for the issue. Through these studies, Sargeras was able to create the prison world Mardum within the Twisting Nether itself. With the prison world in place, it no longer mattered if the demons regained their bodies. They were trapped on Mardum, with no way to escape and return. With Mardum in place, Sargeras and Aggramar were able to successfully continue in their mission to rid the universe of demonkind. The number of demonic invasions dwindled, and after some time, the two parted ways to cover more area than they could as a duo. Eventually, Sargeras came across a world dark with malevolent energy, infected by monstrous entities — the Old Gods. The world was also inhabited by a conclave of Nathrezim. Rather than kill them outright, Sargeras interrogated the demons, seeking to find out more about the malevolent entities infecting the planet. What he learned changed his world forever — because, while demons were a meager threat at best, the Void Lords and the Void itself was a far greater enemy. One that not even the Pantheon could hope to defeat, as it turned out. For the planet wasn’t just any planet. It housed a dormant world-soul, an unborn Titan. And the Old Gods were sent from the Void to corrupt and twist the world-soul into something new: a Dark Titan. Not even the Pantheon could stand up against something that dark and powerful. Enraged, Sargeras struck a mighty blow and cleaved the planet in two, destroying both planet and world-soul within. And then he returned to the Pantheon to report on what he’d found, and to propose a drastic solution. Or at least, Sargeras didn’t think they could. But when he returned to the Pantheon, they were horrified at what he’d done. World-souls were rare, precious things — and the fact that he made the sole decision to simply wipe one from existence was unfathomable. As far as the Pantheon was concerned, they could have found another way, a means of purging the Void from the world-soul without killing it. But Sargeras saw what had been done with his own eyes, and didn’t believe there was any other alternative. He made the right choice — and as far as he was concerned, there was only one path the Pantheon could follow. To this end, he presented an unorthodox plan: purge the universe of all life. Wipe everything from existence, and leave the Void with nothing left to devour. The universe had created itself once before, it would surely do so again — and perhaps that tale would be a different one. But even if it didn’t, a universe with no life at all was better than one consumed by the Void. The Pantheon didn’t agree with his assessment, and viewed his plan as something closer to lunacy than a real plan. Once Sargeras realized they would never see things his way, he left — and he did not return. The Pantheon was no longer seeing reason — but how could they, when they hadn’t witnessed what he had? How could they even identify or fathom evil, when he was the one who had been fighting it all this time? Sargeras knew the inevitability of what he faced, and as he contemplated the issue, fear, doubt, and despair threatened to overwhelm him. His solution was the only one. The universe itself would have to be purged. And if the Pantheon was unwilling to help him, he’d forge an army that would. Fortunately, Sargeras had that army at his disposal. On Mardum, countless demons prowled the surface of the bloated, fel-twisted world. In a single, defining instant, Sargeras shattered the world and set the demonic hordes free, unleashing a torrent of fel energy that twisted and warped him from Titan to a begin composed of fel flame and hatred. He imbued those demonic hordes with his power, and offered them a choice — join his cause, or be destroyed. Few declined his offer, and those few were summarily slain as promised. 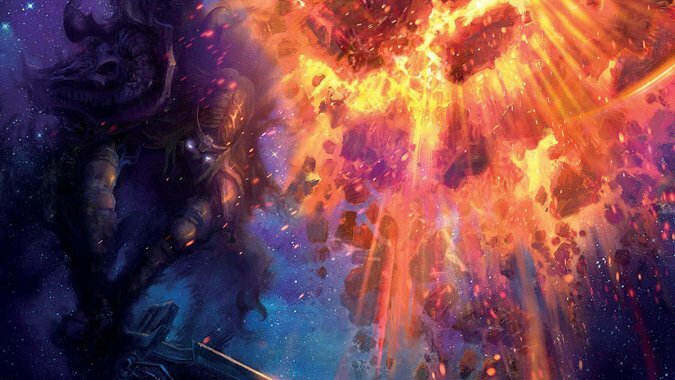 The rest of Sargeras’ story is well known by now — he destroyed the Pantheon, and then moved on in his plans to wipe the universe from existence. But one world has captured his attention, time and time again: Azeroth. Azeroth doesn’t just possess a world-soul, it possesses one of the most powerful world-souls the Pantheon had ever seen. And it also happens to have a lot of Old God inhabitants busy at work trying to thoroughly infect the planet. The Burning Legion’s motives are clear — destroy the universe, planet by planet. Corrupt, create new demons, and wipe it clean of all mortal life. But it remains to be seen whether the Burning Legion actually understands what Sargeras ultimately intends to do. For once existence itself is extinguished, the only lives left in the cosmos will be those of the Burning Legion — and it’s doubtful Sargeras will let them live very long once their purpose is fulfilled. Azeroth presents another conundrum. 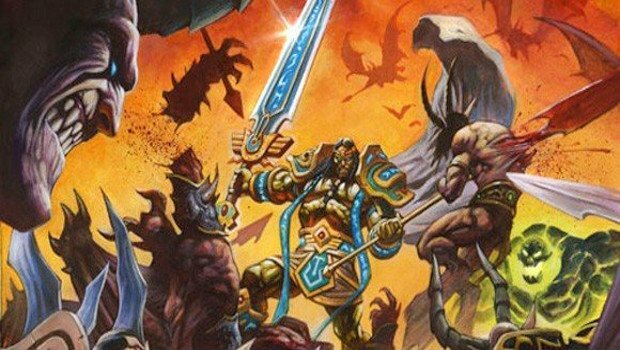 Originally, Sargeras was likely out to destroy the world. A world-soul that powerful would produce a Dark Titan even more powerful. 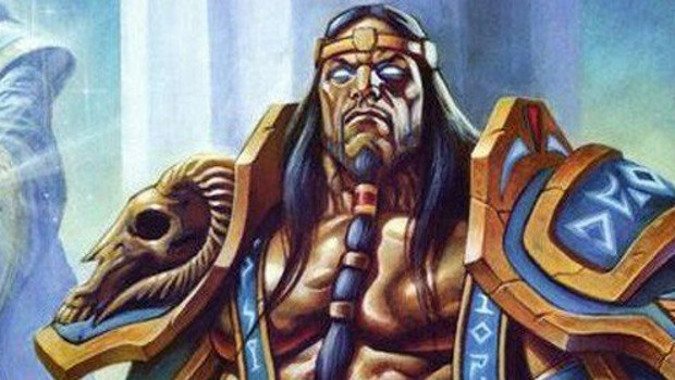 But after the events in the War of the Ancients, Sargeras had a vision in which he witnessed the world-soul opening one eye and affixing him with its gaze. He was enraptured. And it appears that his purpose may have shifted from destroying the world, to simply corrupting the world-soul himself. After all, a fel Titan would be remarkably helpful in scouring existence from the cosmos. But above all else, there is this: Sargeras believes he is right. He cannot fathom a future in which he is wrong. He cannot comprehend a cosmos capable of fighting the Void on its own. And despite his choices, his brutal path is one that is paved with the best of intentions. He doesn’t want to see existence consumed by the Void. The funny part is that Azeroth is intent on proving him wrong — and maybe that’s another reason why he holds that fascination with our world. We do not fit in his plan. Our actions are almost incomprehensible, and our victories offend him. What would the universe be like without Sargeras? Whether we want to admit it or not, he and the Legion may have actually done us a favor. Yes, they’ve wiped a countless, undefined number of worlds from existence — but some of those worlds may have already been consumed by the Void. 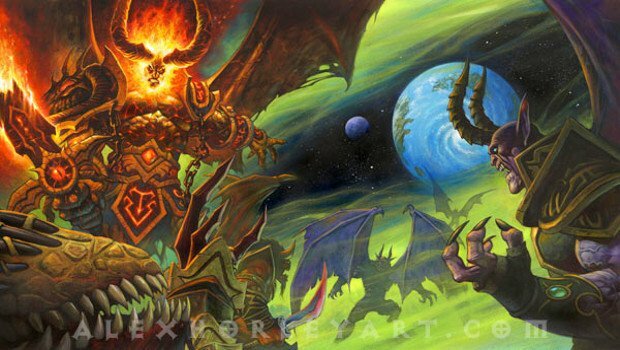 If we don’t have Sargeras lurking behind the scenes, if the Legion isn’t burning a swath of destruction across the cosmos, where does that leave us? Do we then need to take on these worlds on our own? Are we capable of that kind of brutality? Do we even possess that kind of power? It’s hard to say — but it’s interesting to think about. And as we move further onward in our campaign to end the Legion’s assault, these questions may become less of idle speculation, and more of a sobering reality. One thing remains certain — the reckoning at hand is just stage one of something we’ve barely begun to comprehend.